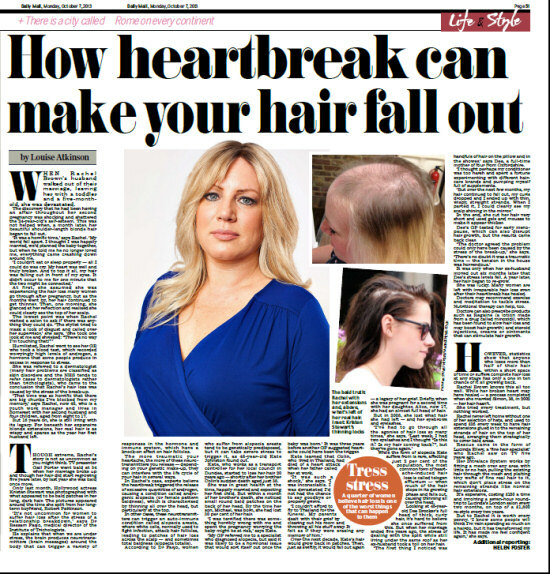 The Daily Mail looks at the effects of emotional trauma on your hair and talks to three women who’ve suffered this type of hair loss, including Lucinda Ellery client Rachel Brown. When Rachel Brown’s husband walked out of their marriage, leaving her with a toddler and a five-month old, she was devastated. At first, she assumed she was experiencing the hair loss many women go through after pregnancy, but as the months went by, her hair continued to get thinner. Then, one morning, she glanced at her reflection and realised she could clearly see the top of her scalp. Humiliated, Rachel went to see her GP, who took a blood test, which recorded worryingly high levels of androgen, a hormone that some people produce in excess in response to stress. She was referred to a dermatologist (many hair problems are classified as skin disorders and the NHS tends to refer cases to dermatologists rather than trichologists), who came to the conclusion that Rachel’s hair loss was caused by the stress of the break-up. ‘That time was so horrific that there are big chunks I’ve blocked from my memory,’ says Rachel, now 40, who is a youth work manager and lives in Somerset with her second husband and four children, aged from eight to 17. But 16 years on, she is still living with its legacy. For beneath her expensive blonde extensions, her real hair is as wispy and sparse as the year her first husband left. Though extreme, Rachel’s story is not as uncommon as you might think. TV presenter Gail Porter went bald at 34 when her marriage broke up and though her hair did start regrowing five years later, by last year she was bald once more. Only last month, Hollywood actress Kristen Stewart was photographed with what appeared to be bald patches in her long, dark hair. The pictures appeared around the time she split from her longterm boyfriend, Robert Pattinson. ‘It’s not uncommon for women to suffer hair loss after the stress of a relationship breakdown,’ says Dr Bessam Farjo, medical director of the Institute of Trichologists. He explains that when we are under stress, the brain produces neurotransmitters (brain messages) around the body that can trigger a variety of responses in the hormone and immune system, which have a knock-on effect on hair follicles. The more traumatic your heartache, the more of these neurotransmitters you release - depending on your genetic make-up, they can interfere with the life cycle of your hair in several ways. In Rachel’s case, experts believe the heartbreak triggered the release of excessive quantities of androgen, causing a condition called androgenic alopecia (or female pattern baldness), which is characterised by thinning all over the head, but particularly at the top. In other cases, these neurotransmitters can trigger an auto-immune condition called alopecia areata, where white cells, normally used to fight infection, attack hair follicles, leading to patches of hair loss across the scalp — and sometimes total baldness (alopecia totalis). According to Dr Farjo, women who suffer from alopecia areata tend to be genetically predisposed, but it can take severe stress to trigger it, as 48-year-old Kate Johnston found out. Kate, who works as a transport controller for her local council in Dundee, started to lose her hair 20 years ago - shortly after her brother Colin’s sudden death aged just 38. She was in great health at the time, happily married and expecting her first child. But within a month of her brother’s death, she noticed small round bald patches on the back of her head. 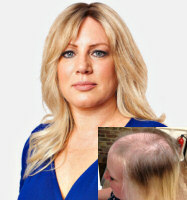 By the time her son, Michael, was born, she had lost 30 per cent of her hair. ‘I was terrified there was something horribly wrong with me and spent the pregnancy worrying the baby might be at risk,’ says Kate. ‘My GP referred me to a specialist who diagnosed alopecia, but said it was likely to be a hormonal issue that would sort itself out once the baby was born.’ It was	three years before another GP suggested heartache could have been the trigger. Kate learned that Colin, who lived in Thailand, had died of a heart attack when her father called her at work. ‘It was such a shock,’ she says. ‘I was inconsolable. I was devastated I’d not had the chance to say goodbye or properly grieve. Over the next decade, Kate’s hair would grow back in patches. Then, just as swiftly, it would fall out again - a legacy of her grief. Briefly, when she was pregnant for a second time with her daughter, Alice, now 17, she had an almost full head of hair. But in 2008, she lost what hair she had left - and her eyebrows and eyelashes. While the form of alopecia Kate suffers from is rare, affecting just 2 per cent of the population, the most common form of heartache-induced hair loss is called telogen effluvium — when much of the hair stops in its growing phase and falls out, causing thinning all over the head. Looking at 45-year old Dee Brooker’s full head of thick, curly hair, it’s hard to believe she once suffered from this. But when her marriage ended five years ago, the stress of dealing with the split while still living under the same roof as her ex-husband took a toll on her hair. ‘The first thing I noticed was handfuls of hair on the pillow and in the shower,’ says Dee, a full-time mother of four from Oxfordshire. In the end, she cut her hair very short and used gels and mousse to make it appear thicker. Dee’s GP tested for early menopause, which can also disrupt hair growth, but the results came back clear. It was only when her ex-husband moved out six months later that Dee’s stress levels fell. A year later, her hair began to re-grow. She was lucky. Many women are left with irreparable hair loss even after their heartbreak has healed. Doctors may recommend exercise and meditation to tackle stress. Nutritional therapy can help, too. Doctors can also prescribe products such as Regaine (a lotion made from a drug called minoxidil, which has been found to slow hair loss and may boost hair growth) and steroid injections, creams or ointments that can stimulate hair growth. However, statistics show that anyone who loses more than half of their hair within a short space of time or suffers complete hair loss at any stage has only a one in ten chance of it all growing back. Rachel Brown knows this all too well. While her broken heart may have healed — a process completed when she married Simon, 38, in 2002 - her hair hasn’t. She tried every treatment, but nothing worked. Rachel never left home without one of her selection of hats, and used to spend £35 every week to have hair extensions glued in to the remaining strands of hair on the top of her head, arranging them strategically to cover bald areas. Rescue came in the form of Lucinda Ellery, a ‘fine hair specialist’ who Rachel saw on TV five years ago. Her Intralace System works by fitting a mesh over any area with little or no hair, pulling the existing hair through the mesh and plaiting tiny wefts of fine real hair to it, which don’t place stress on the remaining strands like normal hair extensions. It’s expensive, costing £150 a time and involving a seven-hour roundtrip to Lucinda’s London salon every two months, on top of a £1,800 re-style every two years. But to Rachel it is worth every penny. ‘I know some people will think I’m vain spending so much on a hairdo, but it has transformed my life. It has made me feel confident again,’ she says.